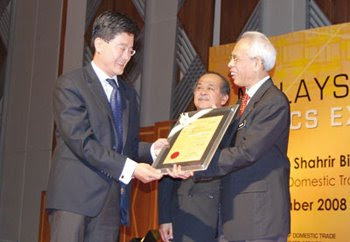 Tong (left) receiving the award from Shahrir. KUALA LUMPUR: Bukit Kiara Properties Sdn Bhd (BKP) has emerged winner of the “Malaysian Business Ethics Excellence Award” under the large companies category, which is defined as those with annual sales above RM25 million or with more than 150 employees. BKP became the first and only property development company to win the accolade twice in a row after it received the inaugural award in 2006, the company said in a statement. The biennial award recognises companies practising exemplary business ethics. The award was presented to BKP group managing director NK Tong by Minister of Domestic Trade and Consumer Affairs Datuk Shahrir Abdul Samad at the Putrajaya International Convention Centre recently. “The business ethics award is certainly an encouragement and endorsement to the BKP team members to continue on the right path and stay the course,” said Tong. He said BKP’s Code of Ethics booklet was available to all employees, business associates and customers in three languages, adding that the 10-page booklet set the foundation to guide the company’s actions with the ultimate objective of improving service to homeowners as well as forge meaningful partnerships with business associates. BKP said this year’s assessment was made based on 31 strict criteria which include the organisation’s commitment to operate at all times with transparency together with ensuring that customers are dealt with fairly and that complaints are handled expeditiously. Seventeen companies, both local and multinationals, participated in the large companies category by submitting details of their best business ethics practices. The winners were selected by a panel of experts from the Business Ethics Institute of Malaysia (BEIM) and academics from Universiti Teknologi Malaysia (UiTM). PETALING JAYA: Property developers are confident the sector will weather the slowing economy with some help from the financial institutions and the Government. Support from the banking sector and the Government was helping to prop up the Malaysian property market, said Perdana ParkCity Sdn Bhd marketing and sales director Susan Tan. “The only thing that needs to be done now is to boost the confidence level in the market and give potential buyers a good impression of the sector,” she said. Perdana ParkCity had this year launched only one new project, The Northshore Garden at Desa Parkcity in Damansara and the response had been overwhelming. “Apart from that, we are selling the remaining terrace houses of Parkhome and Zenia at Desa Parkcity. Hopefully, by next year, we would see fast recovery in this sector to spur our business,” she said. A spokesman from a property consultancy firm said as long as banks were willing to provide loans, the property sector would not be affected much by the current situation. On their part, developers should review current market demand and reposition themselves to face the economic slowdown, he said. “They should know where the economy is heading and what the market really wants. If they manage to do that, they can become more competitive and successful,” he said. Magna Prima Bhd chief executive director Lim Ching Choy said the current slowdown in the property sector had little impact on the company’s business. “The market is still reasonable and the banking sector is still lending support. With the right location, the company is confident of attracting buyers,” he said, adding that it was targeting buyers with stable income and not first-time buyers. “We are moving away from our traditional high-rise development and are now focusing more on landed property with good density for our development at Jalan Kuching and Selayang,” he said. He hoped the recent RM7bil Government stimulus package would help put the sector back on track. This year, the company launched two new developments: a 378-unit apartment project at U1 Shah Alam priced from RM250,000 to RM380,000 per unit, and a 1,070-unit apartment at Magna View Selayang, priced at RM230,000 to RM350,000 per unit. Lim said both projects enjoyed good sales and the company was pushing hard to sell the balance 140 units. Mah Sing Group Bhd group chief executive officer Datuk Seri Leong Hoy Kum said the lower construction costs would certainly help ease the burden of the developers. He said the group was going for lifestyle and medium to high-end market that could contribute better to its business. Petaling Jaya: Naim Cendera Holdings Bhd managing director, Datuk Hasmi Hasnan was named “Property Man of the Year” at the Malaysia Property Award (MPA) 2008 yesterday. Hasmi received the coveted award from Yang di-Pertuan Agong, Tuanku Mizan Zainal Abidin. Naim Cendera’s projects include the Bandar Baru Permy Jaya in Miri, Desa Ilmu and Riveria in Kota Samarahan. “It is important to note that every single person involved with Naim Cendera, earned this award as well,” Hasmi said, adding the company was committed to affordable mass housing instead of prestige projects. The award, dubbed the “property oscars” by industry players, also acknowledged 10 property projects. The winners for the Malaysia Property Award 2008 were Setia Eco Gardens in Johor (Master Plan Development); Lake Edge in Puchong (Residential Development – Low Rise), The Maple Sentul West (Residential Development - High Rise); Shangri-La’s Rasa Sayang Resort and SPA Penang (Resort Development), Pavilion Kuala Lumpur (Retail Development), 1 Sentral Kuala Lumpur (Office Development), Mercedes Benz workshop - Hap Seng Star, Puchong, Selangor (Industrial Development), G Hotel Penang (Hotel Development), The Royal Bank of Scotland Bhd, Penang (Specialised Project) and Mercedes Benz Autohaus - Hap Seng Star Kuala Lumpur (Specialised Project). The International Prix d’Excellence is an annual competition which honours the world’s best property projects. 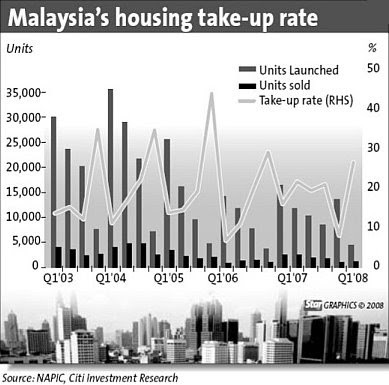 MPA 2008 was organised by the Malaysian chapter of the The International Real Estate Federation (FIABCI). PETALING JAYA: Lower operating and interest costs are helping WCT Bhd cope well with the slowing property market. An analyst said most of WCT’s development land bank was fully paid for and hence the company was not incurring high interest payment compared with developers that had borrowed to procure land. “WCT has the luxury of deferring property launches and waiting for the right time as it does not borrow heavily for its land bank. “In addition, it uses an in-house contractor for its high rise and bigger-scale developments to gain better control of the construction costs and planning,” he said. “However, for landed housing development such as Bukit Tinggi, WCT did sub-contract to others,” he told StarBiz yesterday. WCT’s township development Bukit Tinggi 1 and 2 in Klang have a total 100 acres undeveloped land earmarked for commercial development, while Bukit Tinggi 3 or Parkland has 300 acres for future residential and commercial projects. These areas are fully paid for. For its high-end homes, d’Banyan Residency in Kota Kinabalu, Sabah, which was partially financed, the land cost can be covered by unit sales this year. Priced at RM300 per sq ft, the project has a gross development value (GDV) of RM264mil and so far, homes worth RM60mil have been sold. As at June 30, WCT had unbilled sales of RM174mil to be realised over the next 16 months. Currently, WCT’s property division contributes about 10% and 25% to group revenue and net profit respectively. Meanwhile, WCT unit Jelas Puri Sdn Bhd is developing the RM1.4bil Paradigm, a high-end mixed development project on 12.5 acres in Petaling Jaya, for which it partially financed the land cost of RM85mil. The construction of the basement car park has started and its shopping mall is targeted to be operational at the end of 2010. Construction at another WCT flagship mixed development, Platinum Plaza in Ho Chi Minh City, Vietnam, will begin for the shopping mall by end of 2009, while the launch of the office component was expected by 2010. When completed, it will be the second biggest shopping mall in Vietnam. Spanning 9ha, Platinum Plaza will will also comprise a business class hotel. However, the GDV of the project is still under planning. NEW DELHI: Singapore’s government won’t bail out the casino-resort being built by Las Vegas Sands Corp in the city-state’s downtown, said Senior Minister of State for Trade and Industry S Iswaran. Las Vegas Sands and its Singapore unit Marina Bay Sands didn’t sought a bailout from the government, he added. The government’s tourism board said Oct 29 it’s in talks with the company to “facilitate” the success of the Singapore resort. The stock rose 80% after the statement. “There have been no requests for a government bailout from Marina Bay Sands and neither does the government intend to do one,” Iswaran said, according to a transcript of his comments to reporters in Singapore yesterday. The success of Las Vegas Sands project is crucial for the city-state, which is counting on two casino-resorts to help double visitor arrivals and triple tourism spending by 2015. The Las Vegas casino operator said yesterday it will get a US$525 million (RM1.89 billion) investment from the family of chief executive officer Sheldon Adelson and plans to sell US$1.62 billion more in shares to raise cash and avoid bankruptcy. The casino operator said on Monday it will halt construction in Macau, where it earns two-thirds of revenue, to focus on its US$4 billion Singapore project. Adelson, who owns about two-thirds of the company, was ranked the third-richest man in the US by Forbes magazine before the shares tumbled 95% this year. The casino owner needs the cash to avoid violating the terms of some US loans and triggering defaults that may force it into bankruptcy. PUTRAJAYA: The RM3.12 billion West Coast highway project, first slated to take off 10 years ago, has become a victim of the credit crunch as its concession holder was unable to get financing to implement the project. This is the second time the highway project has run aground. The first time was in 1998 when the Asian financial crisis struck. “The project may be shelved... it may also be opened for re-tender,” said Tan Sri Dr Sulaiman Mahbob, director-general of the Economic Planning Unit (EPU), at a briefing and panel discussion held by the department yesterday. Sulaiman said the West Coast highway project had been deferred because its concessionaire Konsortium LPB Sdn Bhd could not secure financing for the project. Konsortium LPB is 60% controlled by Kumpulan Europlus Bhd (K-Euro), which in turn is 25% owned by construction giant IJM Corp Bhd. IJM bought the stake in K-Euro in August 2007 for RM33.1 million, three months after Konsortium LPB signed the concession agreement for the highway project with the government. The West Coast highway is a key project for K-Euro besides the Canal City property development project in Selangor, which has yet to start. Analysts said the deferment of the West Coast highway project did not augur well for K-Euro’s prospects. Being a shareholder, IJM may not be able to see good returns from its investment in K-Euro following the latest development. “But one consolation is that IJM’s investment in K-Euro was not a big sum,” an analyst noted. The proposed highway, which is the second longest in the country, links Banting in Selangor and Taiping in Perak. It has encountered stumbling blocks ever since it was first awarded in 1998. Since then the prospects of the project had become cloudy as K-Euro itself had financial difficulties. However, the entry of IJM had raised hope the project would secure the necessary financing and commence soon after the concession was signed in May last year. But luck, it seems, is not on its side as the US credit crunch contagion has resulted in difficulties for project financing. In addition, some analysts also have doubts on the viability of the West Coast highway project. While the rise in building materials prices has elevated the costs above the original budget of RM3.12 billion, there are concerns over the likelihood of low traffic volume on the proposed highway. Commenting on other mega public projects, Sulaiman said that Phase I of the inter-state water transfer project between Selangor and Pahang had already opened for tenders. “Tenders have been called for the project. It will be financed by bank loans from Japan,” he added. “The double-tracking project is still on although there are some deferments on certain parts of the project,” Sulaiman said. As for the Second Penang Bridge, he noted that the government was in the midst of finalising the terms with UEM Builders Bhd, one of the main contractors. Going forward, he said the government would focus on promoting projects that had high local content to drive domestic economic growth.